Enjoy the extraordinary setting at our campsite, filled with trees and situated at the lakeside - perfect for relaxing! The catchword for campsite Les Genêts is space. It’s not a question of saving the smallest square meter to put up some accommodation or a plot: the focus is on trees, beauty and the various species that surround our holiday makers, high hedges that provide privacy and beautiful grassed areas that bring comfort and happiness to campers of all ages. The calming paths allow you to rejoin the lake’s bank, our heated swimming pool and the children’s favorite grassland activities - all just a few meters away. 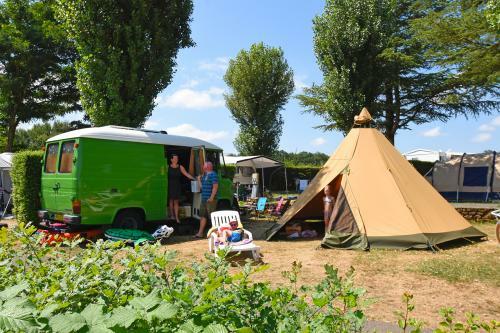 Ideal for going green as a family - our site offers you the best camping conditions: an exceptional scenic setting, a calm and visually stunning environment, water activities to suit you and just the right amount of events. Our campsite with a personal touch also welcomes dogs! A comfort pitch gives you 80 to 100 m2 of private garden space to truly enjoy your holiday. A spacious, adaptable surface for family holidays in large tents, caravans or camper vans. The 6-amp electric hook up point is included in the Comfort package. You’ll therefore have sufficient power for your lights and refrigerator, for example. If your caravan or camper van is equipped with higher energy devices, you can ask to increase the power supply to up to 10 amps. The drinking water tap located on your Comfort pitch means campers in tents don’t have to rely on going to toilet blocks to get water. Caravans and camper vans can also connect their sinks directly to it. Waste water disposal is also included in the Comfort package. For camping holidays free from constraints!